The Environment Group has a wide remit ranging from maintaining a close connection with LADACAN, the residents’ group concerned with the impact of an ever-expanding Luton Airport, to pressing Local Authorities into maintaining the pleasant ambiance we expect (and pay for!). For some time, this ‘Group’ has been a ‘one-man band’ but we would welcome others to join, not only to widen the area occasionally visited (ideally walked by), from the Southdown/High Street area of the present incumbent, but also to broaden our concern into e.g. the use of Tree Preservation Orders (TPOs) to preserve a particular view or setting. - for overflowing litter bins, which so obviously give an uncared for impression of any community: if outside the immediate High Street/Leyton Road/Station Road shopping area (which is the responsibility of the Town Council, Tel. 768278), then phone SADC’s contractor, Veolia on 01727- 809019; similarly for uncollected or dumped bags of refuse. - in contrast, blocked drains, which can lead to large puddles in the road, of obvious hazard to passing pedestrians, and/or cause floods lower down a hill, are the responsibility of Herts County Council, and you should ring 0300-123-4047 (or e-mail their website) and get a Job no. so you can follow it up if necessary. Not surprisingly, with the large - and pleasing - number of trees in the area, combined with the effect of grit from the road itself, this is a recurring problem and a more frequent check would seem sensible and worth pressing for. The Chairman of The Harpenden Society, Chris Marsden, has written letters on behalf of the Society to key officials objecting to the planned expansion of Luton Airport to handle 18 million passengers per year and protesting at the lack of an impartial assessment process to determine whether the expansion can proceed. A letter has been sent jointly to Eric Pickles MP, Secretary of State for Communities and Local Government and Patrick McLoughlin Secretary of State for Transport. It points out that Luton Borough Council cannot apply proper objectivity to the application because it stands to gain financially from the expansion and therefore must not be allowed to decide upon granting the go ahead for the development. The letters amplified the Society’s concerns. 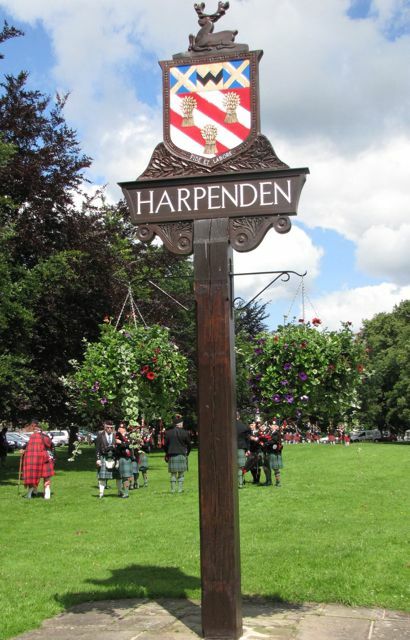 Road traffic to and from the expanded airport would generate an estimated extra 7,500 cars per day on the roads through and near Harpenden. Rail services will become unacceptably overcrowded. Thameslink’s current rail capacity, which Luton airport currently admits is inadequate, will be diminished if the rail freight depot at Radlett goes ahead as planned. Noise from aircraft overflying Harpenden is forecast to rise dramatically especially in the unsocial hours in the night and early morning. A letter has also been sent to the Development Control Manager of Luton Borough Council pointing out that since the Council received £25 million from passenger revenues in 2011 then it cannot decide on the merits of the expansion because of the conflict of substantial income versus planning considerations. A similar letter has been sent to the Managing Director of London Luton Airport Operations Ltd.
Chris Marsden concluded, “not only do we object to the proposed expansion due to road, rail and noise considerations we fundamentally object to Luton Council adopting the role of poacher and gamekeeper. An independent third party must assess the project so that Luton’s impartiality is not compromised. We are simply requesting a fair assessment process.